Another Year-End Matching Gift Challenge = Success! 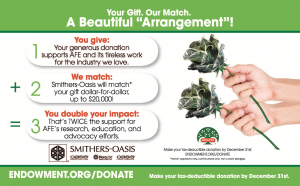 Smithers-Oasis/FLORALIFE® teamed up with AFE for a second year-end matching gift challenge. Thanks to their generosity, year-end donations made to the Endowment by December 31, 2018, were matched dollar-for-dollar up to $20,000. Industry members jumped at the chance to support floriculture and as a result, the goal was exceeded in only 14 days! Thanks to the support from the industry and Smithers-Oasis/FLORALIFE®. Thank you again to Smithers-Oasis/FLORALIFE® for your generous contribution and for supporting AFE’s programs that promote and advance the industry! For those who didn’t get a chance to donate, you can still support AFE’s industry efforts by making a tax-deductible contribution today.